Rosemary is one of the easiest herbs to grow. It is incredibly hardy and will thrive as long as you plant it in a sunny spot where the soil drains well. In fact, the Latin generic name Rosmarinus means “dew of the sea” due to the fact that it often grows along the coast. Rosemary is best grown from an existing plant, as seeds can be tricky to germinate. We have a wide range of rosemary plants on offer at our three branches in Bellville, Kenilworth and Milnerton. Rosemary needs three essentials to thrive: sunlight, well-draining soil and sufficient air circulation. So make sure you choose a sunny spot where it has space to grow. Rosemary is not a hungry feeder, but it will appreciate a light feeding of a kelp-based fertiliser like Seagro in spring. Rosemary can be cut back hard in summer, after flowering. Add sprigs of fresh rosemary to roast chicken, lamb, vegetables or potatoes for a wonderfully “earthy” taste. 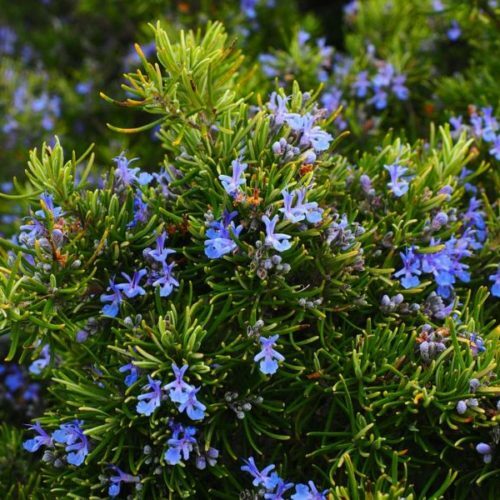 Rosemary has been shown to improve the stimulation of blood flow to the head. For this reason it can help to improve memory and concentration. The antiseptic and antibacterial properties of rosemary tea make it an excellent drink when you are suffering from colds and flu.